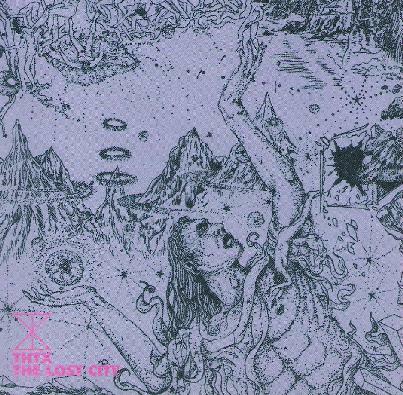 THTX - "The Lost City"
Blending equal parts Hawkwind and Sun Ra, and something that's all their own, THTX deliver some spellbinding spontaneous jams on their latest, The Lost City. Consisting of the duo of Matthew Smith on guitars, bass, organ, and trumpet and Kerry Gluckman on drums and percussion, THTX creates a sound so full of rich, instrumental psychedelic explorations that it's a pure delight for the ears. Just take the opening cut, Macrocosmic Refraction, for example, with its menacing bass line, swirling tripped out organ, and massively psychedelic guitars filling the void, taking you into the stratosphere. I particularly liked the trippy, Latin influenced sonic jaunt of the title track, with its juicy wah wah guitars, intense, distorted organ and echoing trumpets. I could just picture racing in jeeps through the Central American jungle and coming across the runes of some mysterious, lost civilization! The Second Street Sorcerers gets a tasty polyrhythm going on percussion before distorted, freaked out guitars rip through it, a groove based rocker that will have your head nodding in the cosmos. Black Lights is a little more freeform, a mystical, ambient journey under darkness, with spaced out organ and added help and jazziness from saxophonist Len Bukowski. Nightfall finishes things off with a heavy, jazz-rock jam in fine style. Endlessly inventive and downright cool (put your dark sunglasses on! ), this is space rock/jazz at its best, and it's become one of my favourite albums of the past year. For more information you can visit the THTX web site at: http://www.thtxinfo.com.